We had a brilliant time last week running workshops to identify the top tasks that staff need to complete when they visit the website. These were very useful sessions that not only allowed us to gather the crucial data we needed, but also gave staff from across the University a chance to speak to others who share the same frustrations. Top task management is a methodology for getting to the heart of what people want from your website. It essentially focuses you on what your users are trying to do when they come to the website, rather than what you’re wanting to tell users. The two are not always the same thing. As a University, we’ve tended to focus on telling people what we want them to know, rather than developing content to support what they want. A List Apart has a great article on top tasks management for more information. We ran a series of five workshops aimed at staff from across the institution. We had a great response with over 65 attending from the following areas. For us as web specialists, what this does is lay out who we’re designing for, what it is they are trying to do, and what they judge to be the success criteria for the task. In the above example, if we simply had a list of everyone’s names, we wouldn’t necessarily be helping them find the right person as there may be multiple people with the same name or function within a specific area. So user stories help us understand the problem we are trying to solve. What kind of response did we get? 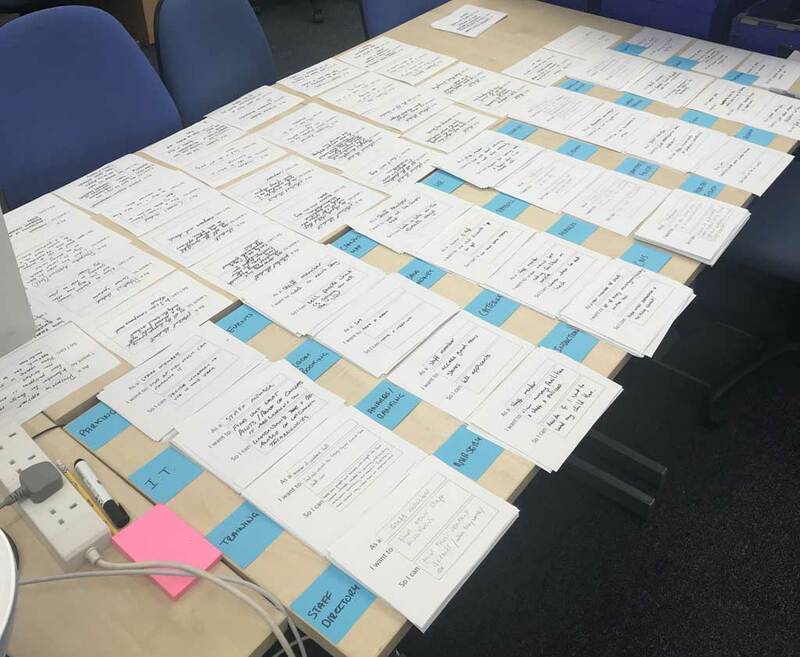 Those attending the workshop really got into this approach, and we ended the week with over 600 user stories to work with. Whilst that may seem a lot, the beauty of top task management is that you start to see common issues appearing from across the institution. These become the top tasks that help us focus our efforts on tackling the big things that the largest number of people need the website to do. We’ll gather together all these tasks and start to remove the duplicates so we can whittle it down further into a more manageable list. Once we’ve completed that work we’ll be sending it out to a newsletter subscriber list to allow them to vote on the things that they feel are the top tasks. If you want to be included in that list, here’s how to subscribe. Are there any early indications what they might be? There were some very strong early messages coming out of these sessions from just about everyone who was there. As you might have guessed, the ideas behind statements 1-3 could really be applied to any website. Statement 4 was by far the most interesting. Those attending the workshops were extremely frustrated when it came to finding information on the website. Time and time again we were told that when performing their job they’re having to “signpost” people to lots of different places, simply to answer a single question.